Design is delicious, and recently I can’t get enough of it. I’ve been particularly into watching the fad of data visualization heat up over the past few years, with sites like this, this and this featuring some amazing feats of creative information display. I was even inspired to start dabbling in it myself, and have already posted a couple examples of my (typically) amateurish attempts: here and here. David McCandless has been making a name for himself in this realm, and after spending some time on his blog I decided to order his new book, The Visual Miscellaneum. I’ve found it to be a great resource for fresh visual approaches, although his visual style starts to seem a little homogeneous after a while, and his research a little (ok, a lot) too Wikipedia-heavy. 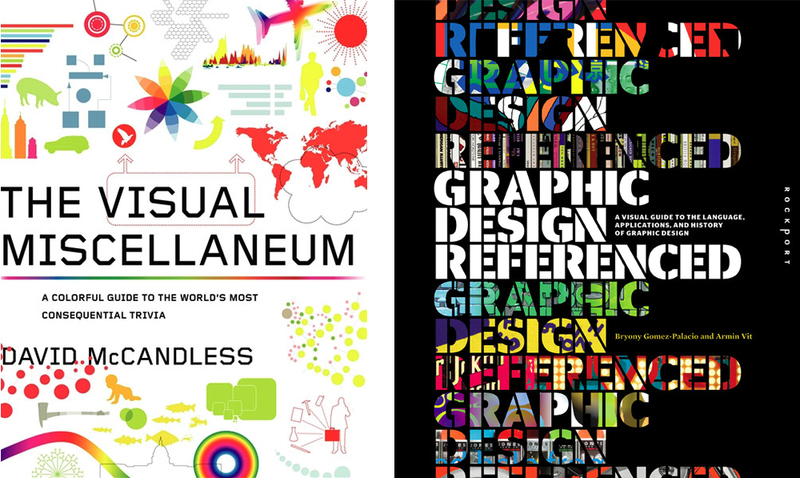 Graphic Design Referenced, a compendium of graphic design history and practice by the awe-inspiring folks behind this blog, is a beautifully designed and structured fusion of classic and contemporary design. Lots of juicy visuals to drool over with a fair amount of insight providing real value.